May | 2015 | Beauty. Skin Whitening. Health & Sexual Wellness. Glutathione competitively inhibits melanin synthesis in the reaction of tyrosinase and L-DOPA by interrupting L-DOPA’s ability to bind to tyrosinase during melanin synthesis. These results indicate that glutathione inhibits the synthesis and agglutination of melanin by interrupting the function of L-DOPA. 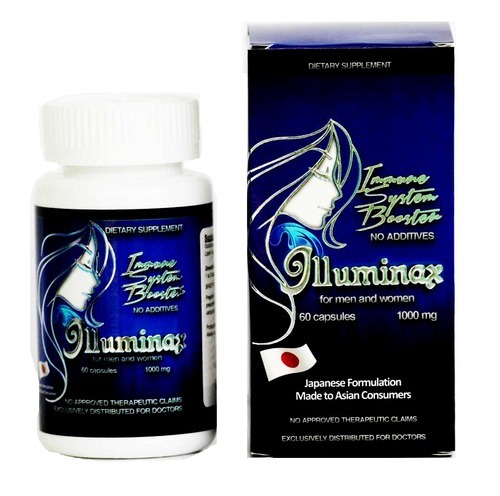 2 Capsules once daily or as advised by your physician. * Continuous usage may make your skin smooth and fairer. Vitamin C – is also known as ASCORBIC ACID. It is a water-soluble vitamin and a powerful anti oxidant. Vitamin C is used for the growth and repair of tissues in all parts of our body. It helps the body make collagen, protects the body and preventing heart attack or stroke. Silymarin – the active extract from milk thistle. Silymarin is a powerful antioxidant said to protect and regenerate liver cells (and other cells in the body and brain) from toxins. 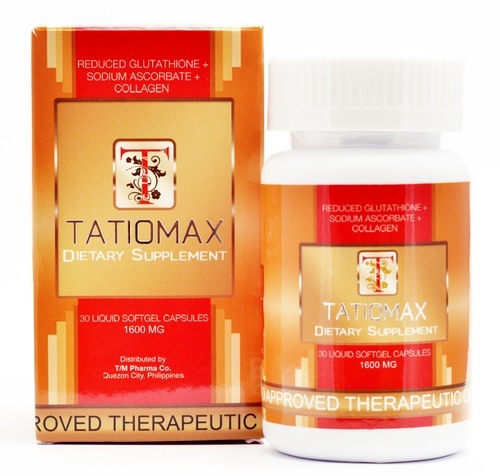 It apparently promotes liver cell protein synthesis and decreases the oxidation of glutathione . It helps in the treatment of cancer (liver, colon, skin and prostate) and Type II diabetis. Alpha-lipoic acid is an antioxidant that is made by the body and is found in every cell. It is an antioxidant that attacks “free radicals,” waste products created when the body turns food into energy. Alpha-lipoic acid is said to prevent or treat many age-related diseases, from heart disease, and stroke to diabetes and Parkinson’s disease and Alzheimer’s disease, as well as declines in energy, muscle strength, brain function, and immunity. Grape Seed Oil Extract – Grape seed extract contains powerful phytochemicals. The antioxidants in grape seed extract may prevent cancer. Grape seed extract is useful for its effects on high blood pressure, artherosclerosis, vision problems, and reducing cholesterol and swelling. It’s a traditional remedy for stretch marks and can be used on delicate areas of the face, such as under the eyes. Grape seed oil is high in vitamin E and spreads well on the skin. LUXXE WHITE is ENHANCED GLUTATHIONE. It is considered as a MASTER ANTI-OXIDANT. It is also an extremely important cell protectant. Glutathione is a primary protectant of skin, lens, cornea, and retina against skin damage. It also aids in detoxifying the liver, kidneys, lungs and other organs. Aside from the anti-oxidant properties and liver detoxification capabilities, Glutathione is also widely used globally for its skin whitening and lightening side effects. 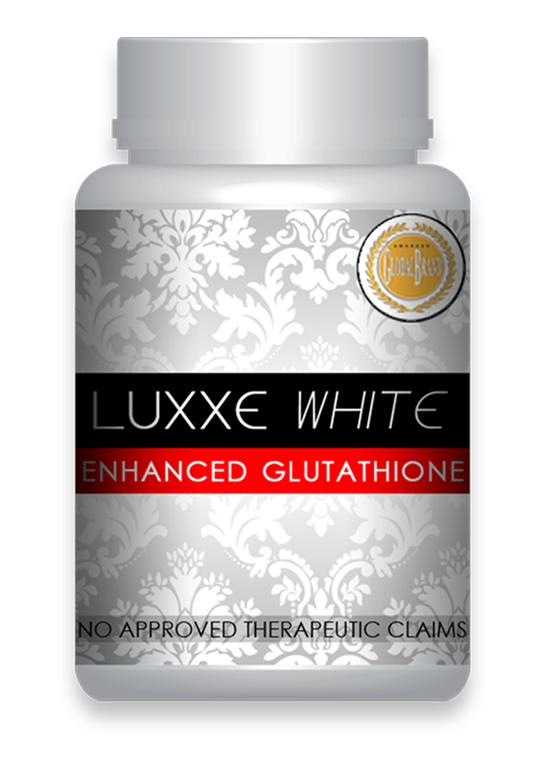 Unlike other types of Glutathione, LUXXE WHITE is an ENHANCED GLUTATHIONE ACCELERATOR. Taken as a dietary supplement, LUXXE WHITE help support the body’s own production and preservation of Glutathione. It is clinically tested to be easily absorbed by the body, as compared to regular glutathione therefore, providing a more radiant and glowing complexion you’ve always dreamed of. Glutathione shows its health benefits because of its ability to trap harmful substances.Other than that, it is also involed in a variety of functions that are very important for human health. Glutathione is a compound that is present everywhere in the body, means glutathione is present in every part of the body and therefore, it is very important in attaining good health. It is found in liver, lungs, and in the digestive system in high amount. Glutathione is a primary protectant of skin, lens cornea, and retina against radiation damage. In liver, it is produced and stored and used as a detoxifier and detoxify all the harmful compounds which are eliminated by the body. Glutathione is also present in bloodstream that helps in boosting the ability of defense system to fight against disease. Glutathione supplements are also favorable for anti-aging purpose. 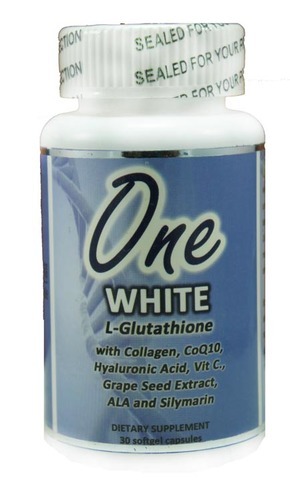 During the process of agin, the level of glutathione in the body decreases. So, as the body ages, it becomes more vulnerable to the damage caused by harmful particles. It is especially important fir aged people to supplement their bodies with antioxidant that can bring the activity of harmful particles (free radical) to an end. ​ level of energy, positive mental activity and general sense of well being. Recommended for people undergoing chemotherapy because according to studies, Glutathione reduces side effect of chemotherapy without reducing its efficacy. – Effect may be seen in as quick as 21 consecutive days of intake. 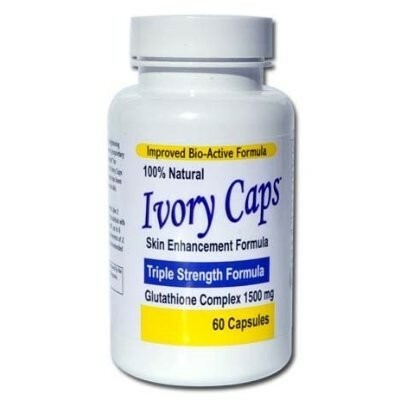 Ivory Caps is an enhanced nutritional supplement supporting skin whitening utilizing a high potency proprietary “Skin Essentials™” Glutathione Complex for results. In 2004 the makers of Ivory Caps had embarked on a business plan to develop the company’s most powerful product for supporting skin lightening product. Not only was this formula meant to be effective, but also safe for normal use. Though the idea was simple enough, the research and development to create such a product was surprisingly extensive. Every possible factor was considered in creating this revolutionary proprietary formula called “Skin Essentials.” What ingredients should be used? How should they be applied? Even minute factors like, what kind of container will keep the ingredients fresh and active. Upon completion, the product was officially named Ivory Caps® and this new formula incorporated the industry’s latest research and most cutting edge technologies. And after two years of tests and trials, it was finally available for the public in the fall of 2006. Since then, the R&D Team has been continuously improving the formula and product line with new innovations making Ivory Caps® the most advanced formula on the market today. Every ingredient in The Ivory Caps “Skin Essential Glutathione Complex” has been clinically tested to provide maximum skin enhancement benefit. Powerful yet gentle and soothing, is the secret to Ivory Caps revolutionary Skin Lightening Support Cream. acid join with natural moisturizers to soothe and protect, while exfoliating skin and decreasing melanin production. Alpha-Arbutin is a powerful, yet gentle, lightening agent derived from the Bearberry tree. Alpha-Arbutin brings all the benefits of strong melanin inhibitors like hydroquinone without the strong odor, toxicity, and potential side effects. Alpha-Arbutin is quickly becoming the logical alternative to harsh skin lightening chemicals. Hyaluronuic acid is a naturally occurring lightening agent which is a major component of skin. When skin is exposed to excessive UVB rays, it becomes inflamed (sunburn) and the cells in the dermis stop producing as much hyaluronan, and increase the rate of its degradation. Hyaluronan degradation products also accumulate in the skin after UV exposuresitive skin. While some brighteners may feature Alpha-Arbutin or Hyaluronic acid alone, our advanced nutritional process allows us to combine both powerful lighteners into one all natural product that is safe, effective, and beneficial to produce results! • Easier burning of fats during physical workout, supporting your desire to achieve a slimmer body.